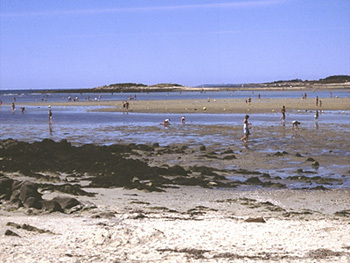 Sheltered sandy beaches of the bretonic coast (near Roscoff, Carantec, Carnac, La Trinite sur mer) are well-known habitats of the acoel flatworm Convoluta roscoffensis (order: Acoela, phylum: Platyhelminthes) which can be found there in summer time on a massive scale. During low tide, when water puddles form at sandy beaches, Convoluta roscoffensis gather together at the surface of these warm floodlit pools to provide optimal photosynthetic conditions to their symbiont Tetraselmis convolutae, a green alga living inside the flatworm's body. 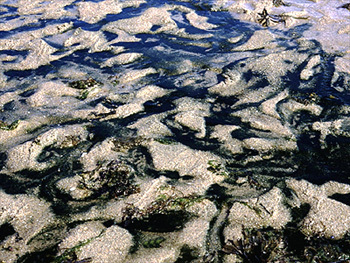 At first glance the green coloration of sea water puddles seems to be caused by massive accumulations of algae. However, at closer observation color is obviously due to millions of tiny green flatworms (up to 15 mm in length) continuously moving around. 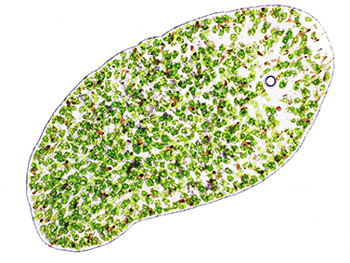 A microscopic inspection of a translucent iuvenile worm reveals that gut and parenchyma cells are filled with photosynthetic symbionts, microalgae of the genus Tetraselmis. 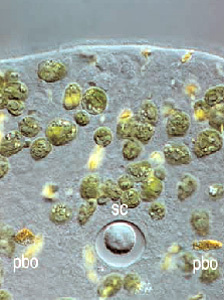 In the iuvenile state those microalgae are ingested but not degraded and become endosymbionts. 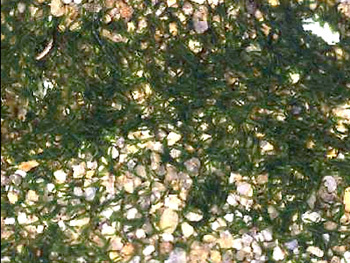 The algae remain photosynthetically active and thus, significantly contribute to the energy intake of the worms. In Convoluta roscoffensis up to 25.000 algae per individuum have been counted. After entering the adult phase, crucial anatomical changes such as loss of a functional pharynx and mouth, demonstrate that the worms now completely rely on their endosymbionts. 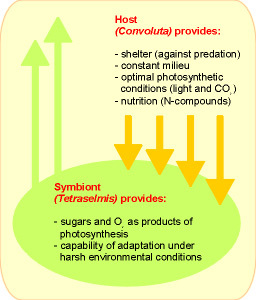 They have become photoautotrophic organisms consuming sugars provided by the symbiontic algae. depicted on this flow scheme. © Marine Flatworms of the World, Wolfgang Seifarth 1997-2002, All Rights Reserved!